Another day; another blog post about not feeling great. Some progress today. More reading. More rest. 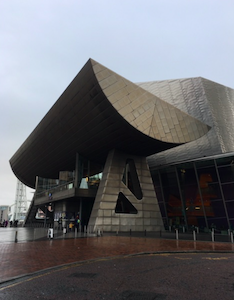 A trip out – to fulfil a long-promised visit to the Lowry in Salford Quays to see The Gruffalo – the beloved Julia Donaldson classic. I am starting to feel a little better – the pain is subsiding and my levels of anxiety which have unhelpfully been raised by my physical sickness – are returning towards equilibrium. I am hoping to return to proper blogging over the next few days. In the meantime, I am taking comfort from the extra cuddles I am getting from Miss J; Dr J taking over the cooking duties; Leinster’s great comeback win today in Dublin (watched from my sofa with my budding Irish rugby fan at my side) and the prospect of the Strictly Final later. It’s not all bad.